The Row and Brunello Cucinelli clothing embody luxury in the form of comfort, versatile, casual elegance, with pieces that last for seasons to come. The clothing can be mixed within the brands, but the clean and casual design go well with other brands with great quality. A Brunello Cucinelli navy sweater with subtle paillette shimmer can be layered over a Brunello Cucinelli white button up shirt. The Row Medicine Pouch Handbag in black can be incorporated into any wardrobe. 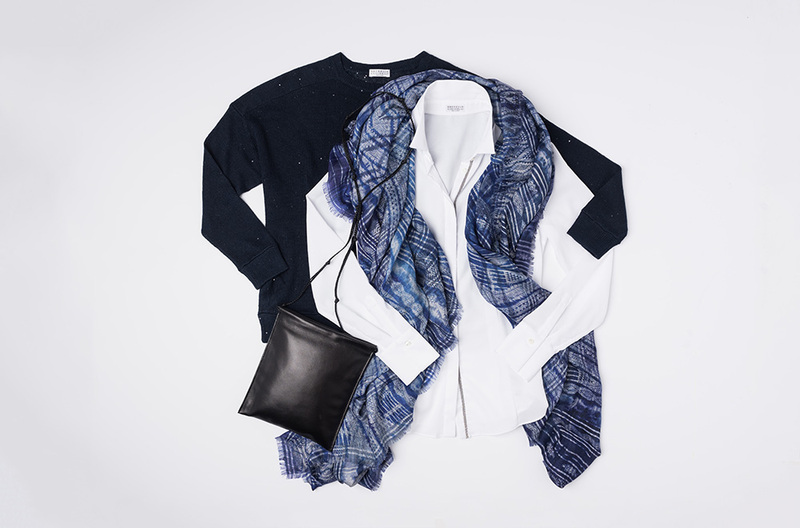 The Alonpi Cashmere blue and scarf adds dimension and a personal touch. The Row is sold in-store only. Please call (505) 982-4066 for inquiries.